There are many things you can expect to occur should you decide to improve your hearing health and quality of life with the help of hearing aids. Following a recommendation for hearing aids, our hearing healthcare experts will work with you to choose a hearing aid style, technology level, and accessories that will suit your hearing loss, lifestyle, and budget. After choosing your hearing aids and accessories, everything will be ordered from the manufacturer. This can take anywhere between approximately 5-14 days depending on whether custom molded products are required. The hearing aid fitting appointment takes approximately 1-1½ hours. The first 15 minutes or so will involve fitting the hearing aids to your hearing loss prescription. When the hearing aids arrive from the manufacturer they are a blank slate – there is no prescription programmed. A lot of people expect the devices to arrive programmed with their prescription (similar to the way glasses are manufactured) – this is incorrect. Hearing aids are programmed at the initial fitting because we require your ears to program them. Various measurements are taken in your ear canals at the fitting appointment (both with and without the hearing aids) with extremely sensitive microphones. This process is called Real Ear Probe Tube Verification, sometimes more generically called Live Speech Mapping or Real Ear Measurements (REM). Unfortunately, this is a step that is often skipped during hearing aid fittings – and it is arguably one of the most important steps of the entire hearing aid fitting process. Research suggests that approximately only 20% of hearing aid fittings are completed with real ear measurements. In other words, only 20% of hearing aid users are currently using hearing aids that were set properly with the correct prescription. 100% of hearing aids fit at Acoustic Audiology use real ear measurements. Ears come in all shapes and sizes, and every little twist and turn in them changes the way sound travels through your ear. Sound is also influenced by a vast array of other factors: the texture of your skin, the amount of fat under your skin, texture of your ear’s cartilage, the size and shape of your head, your shoulders, torso, etc. - it all changes how sound arrives at your ear. The only way we can account for all of these unique variables is by measuring and adjusting the hearing aids in real time while they are in your ears (i.e. Real Ear Measurements). You can expect to hear all sorts of sounds during the fitting process. Many of them will be enjoyable, but do not get discouraged if others are annoying or “too loud.” The hearing aid fitting process involves measuring how the hearing aids are processing all sorts of sounds. This ranges from soft speech to average speech, to sharp “s” sounds and loud beeps. For more information on Real Ear Probe Tube Verification, CLICK HERE. Following real ear verification, your hearing aids will be set to your prescription. However, this is likely not how you will leave our clinic if this is your first hearing aid fitting. Your hearing aids will likely be set quieter initially, to give your brain time to adapt to all of the extra sound. Think of your hearing aid prescription like a target – with practice we will work towards hitting the target. But like any target, we may never be able to hit it. With practice, motivation, and dedication, the majority of people are able to hit their target, reaching their hearing aid prescription. Others require small changes to their prescription even after reaching it. Only time will tell how you will adjust to amplification. Depending on how the initial fitting went, a series of follow-up appointments will be booked during your trial period. The majority of people are seen approximately 2-4 weeks following initial fitting, with subsequent appointments made as necessary. However, a follow-up is often booked sooner for various reasons. 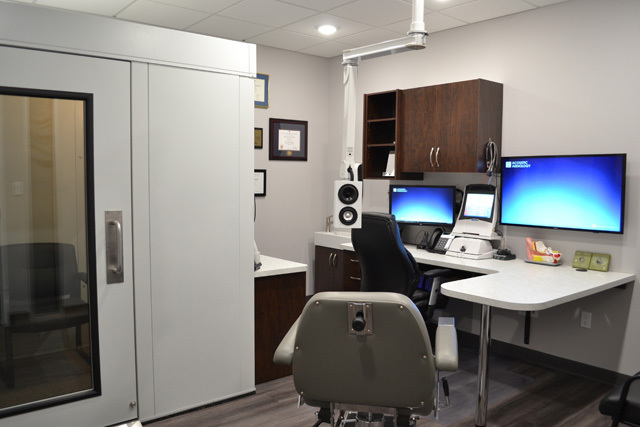 All clients are encouraged to call and book any appointments necessary during this trial period as it is a sensitive period for your hearing system, and your nervous system, as it adjusts to all of the extra stimulation. Once we have determined that your hearing aids are helping you hear better in most situations and improving your quality of life, a long-term relationship has been established. Our goal is to get you to your prescription, but there is no rulebook as to how long this will take. Prescriptions also need to be fine tuned once they have been reached – and we need your feedback in order to do this. At minimum, we should clean and check your hearing aids every 6 months and retest your hearing annually so we can adjust your prescription as necessary and ensure your hearing aids are within operating specifications. Unlike corrective glasses, hearing aids can be continually readjusted as your hearing changes. When hearing aids are first chosen we ensure that the hearing aids have enough “reserve gain” (i.e. enough available unused amplification should your hearing change) to accommodate typical changes to your hearing. The hearing aid fitting process is about more than just hearing better. It is about helping you and your loved ones minimize the impact hearing loss has on your life and empower you to be yourself. By improving your hearing, you can continue doing the things that you love and ultimately enjoy a fuller, richer, and healthier life.